The Dark Ranger: A win after a wild first period. Ok, so not too much was wild after the first period. Just the same, the blueshirts showed the ability to adapt and carry an edge that was missing as they tried to just concentrate on scoring a goal in the last 2 periods against Ottawa. In the first game I had been to at the garden in a long while, it seemed as though the excitement in the air was back at the worlds most famous arena. The stale stench of the lifeless team that leaked on to the ice the last time I was there a few months ago, had been replaced by hope and anticipation. Could it be the overflow of a stretch run for a playoff spot? Probably. Whatever it was it, It was surging through the latter part of first period. A throwback fight between Avery and Cal Clutterbuck, where both dropped the mitts and helmets and had a good square off was a bit of a see saw battle, where no big seemed to be exchanged, but ended with an Avery on top as both players went to the ice. Shortly after that Orr registered an clean, hard hit on Owen Nolan who took exception with a cross check, never dropped his gloves and got punched in the mouth for his trouble. Orr then allowed his foe to shed his gloves and square up briefly before pummeling again. Both fights had the garden on its feet and roaring . Things only got louder with 4.4 seconds to go in the period, where Zherdev exhibit some patience before scoring from a bad angle over a downed and scrambling Backstrom. Early in the second period, Gaborik would tie it up for the wild on a redirection to continue his come back. That would last long though (less than a minute, in fact), as moments later Gomez would score off a pass from Avery to exhibit some of the Ranger's resiliancy. The second period continued with some scrums and jousting between players, but no scoring. The third was relatively quiet, until the clock started to tick down to the final minute and ranger players and fans clinched that teeth looking for an elusive empty netter that was close but never came after Ryan Callahan was hacked across the arm as he was being pursued by former Ranger, Kim Johnsson, on his way toward the empty net. Quick Thoughts: The garden was more fun than it had been in a while. Many thanks go out to a friend that gave me the tickets. Michael Sauers first game as a Ranger went fairly smooth as he kept things simple. Aside from a carreen off one of the sideboards that started a rush for the wild, he seemed like he could get comfortable at the NHL level. Hes a big kid who seems strong on his skates, knows his role, and was trying to be responsible in his own zone. Lastly, Madison Square Garden, has a lot of F*ckin nerve. As I walked past the Double Team store last night, I saw a sign that suggested fans trade in their old Jerseys for 30% off a new jersey. 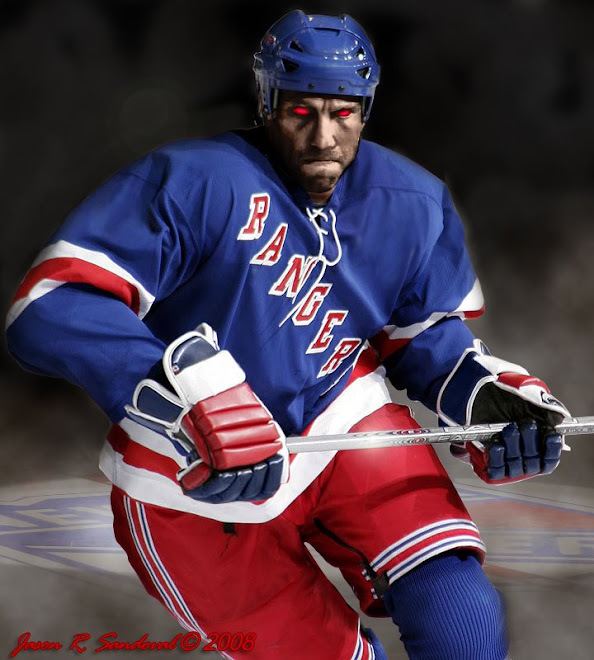 That $hit may fly in a place where expansion hockey is played, but its an insult to Rangers fans that have been coming to the garden for years to watch this team, collect the autographs, meet the players, heckle the fans of visiting teams and wear their jerseys with honor and pride. As a collector of rangers jerseys, I am sickened at the offer to trade one of my CCM, or KOHO, Pro Player one ice jerseys with the the double stitching, double elbows, fight straps, names and stitched on names and numbers .... for one of those, overly soft, tear away, shrink wrapping, sweat repelling, Red-dickied, bib-bottomed, slenderizing reebok nightshirts with the iron on details. Trade in my Tradition for a shiney new cookie cutter Crosby endorsed special? NEVER!!! Minnesota's style could certainly put you to sleep, But the Rangers did what they had to do to get the win. I don't own one and am going to hold off on buying one for as long as possible. I have a few CCM's but I've been wearing the same starter jersey for about 10 years now. Manic, I have a Koho, 2 or 3 ccms, A player worn(Turns out it was from Blackburns rookie season)preseason scrimmage jersey that I bought for some weekend warrior roller goaltending. Theres some wear on the liberty head crest from the pucks and some sprawling (sometimes on asphalt) but its still in incredible shape considering whats it been through. Those new reeboks would never stand up to that kind of abuse. I have to say "new" because I got a Shanahan Reebok one from that first year right after they acquired CCM but CCM was still in charge of production. Those newer crosby tested and approved monstrosities are more on par with those nike olympic replicas that were turned out that last winter olympics. Suprisingly there are still retailers with pockets of old CCM stock jerseys. From a picture that one of the vendors sent me, the customization numbers look less than authentic though. I think my first was a starter from the cup year. I wore the hell out of it till I outgrew it. I don't think I could feel that way about one of the new ones. 1) 30 freekin % off? Thats gotta be a joke! They should pay you for a 'vintage' jersey! 2) BTW, with NJ, Boston and DC coming back down a bit and the new enthusiasm in NY, a nice long playoff run is now a possibility. We wouldn't have said that a month ago!